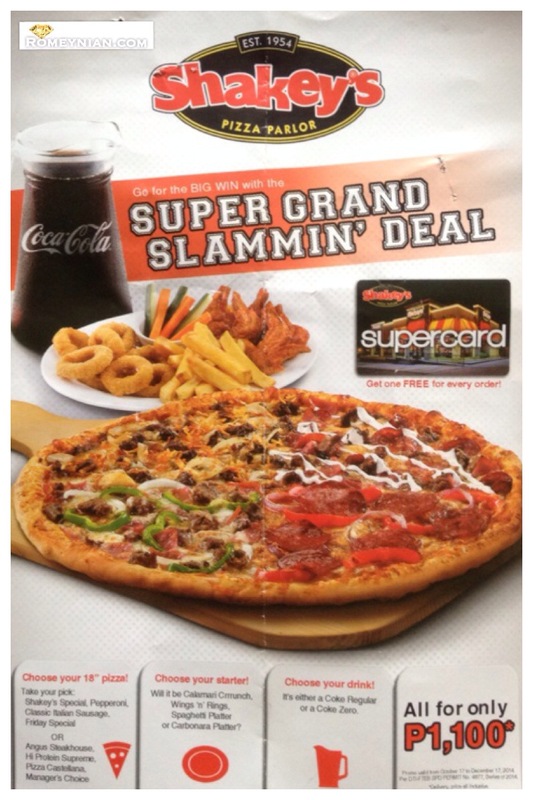 Order a SUPER GRAND SLAMMIN’ DEAL for delivery and get one (1) SHAKEY’S SUPERCARD for free! Hurry it’s only up to December 15, 2014! How did I learn about this? When they delivered my pizza (Angus Steakhouse & Hawaiian) my receipt comes with this flyer. So I verified it with their agent in their delivery hotline (77-777). You just have to order the grand slammin’ deal and you’ll get the card for free. If your card is expiring soon! You don’t have to renew your card, just purchase the grand slammin’ deal and get a new card for free!!! But you have to hurry it’s only until December 15, 2014! Update: This is also available for dine-in at P999 plus service charge! ← It’s Christmas at Trinoma!